To celebrate the Queen’s Golden Jubilee in 2002, a small woodland was planted to the north-east of the village. 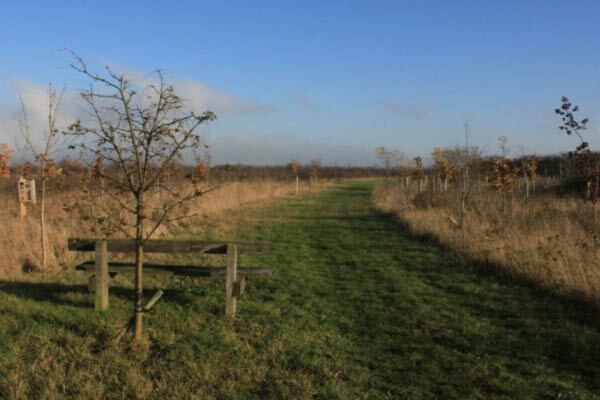 The woodland has public access via a path from Mill Road and is an area for all to enjoy. 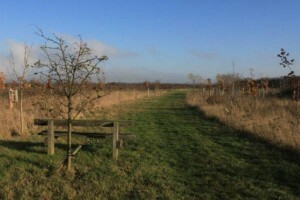 A range of trees were planted including blackthorn, hawthorn, oak and ash, with wide grass rides between the wooded blocks. These rides are sun traps and provide invertebrates with long grass to shelter in and flowering plants to feed from. The blossom on the trees is also a good source of nectar for insects such as butterflies. The woodland is currently quite sparse but, as it grows, it will provide excellent foraging opportunities for amphibians and create darker, damper areas for them to utilise. The woodland is surrounded by a dense hedgerow which acts as a corridor for creatures moving around the area. A new pond for the woodland was added in 2011 and is a great benefit to the local amphibian population. 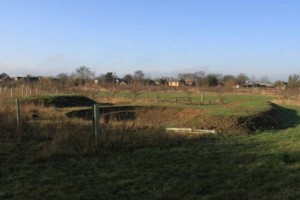 The pond is located in the northern half of the woodland, in a large open area. This ensures it gets lots of light and few leaves will fall into it. The pond is deep enough that it will not freeze through during the winter as this will enable amphibians to over-winter at the bottom of the pond in safety. The large size of the pond means it will be possible to create a variety of microhabitats according to differences in the bank gradient, the shape of the pond edge and the proportion of the water that is vegetated and not. This will attract a wider range of species including some dragonflies, beetles, amphibians and birds.